My first thought after viewing pictures of this out of this world-gorgeous-jaw dropping resort was "That's it. Pack your bags and go!". Milaidhoo recently opened in Nov'16 and by the looks of it, they don't look like your typical 5 star luxury resort. 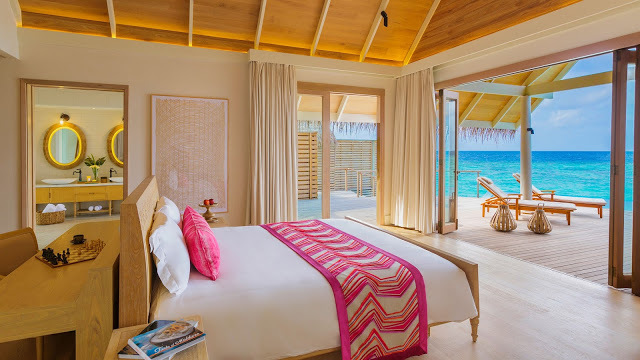 Specifically designed for couples; the resort consists of water pool and beach villas; both emanating the state of excellent comfort and lavish living. I love the use of a neutral base topped off with a layer of one bold color, it adds a touch of freshness that contrasts perfectly well with the beautiful ocean, white sands and tropical greenery. Are you feeling like you need a relaxing holiday yet? Scroll down for more!